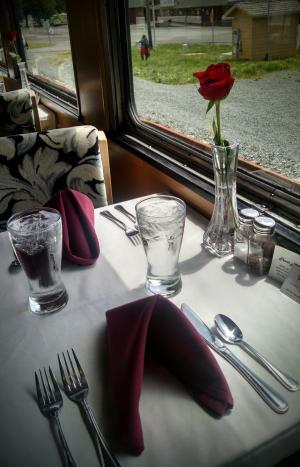 The Oregon Coast Scenic Railroad operates a scenic excursion Dinner Train from our depot in Garibaldi, Oregon. Each excursion is a three-hour journey along the Oregon Coast and includes a variety of seating and meal options. All trains depart from Garibaldi, Oregon. *CLUB CAR (GENERAL ADMISSION): BRING YOUR OWN MEAL. CATERED MEAL NOT PROVIDED FOR GENERAL ADMISSION. Coffee, soda, and water are complimentary. Alcoholic beverages are not available at this time. Dining Car: Ticket sales close the Wednesday before the departure date. Club Car: (Tickets $40/each) This new service welcomes our passengers to join us for a ride to enjoy the scenery along the Oregon Coast without the dinner option. Passengers are welcome to bring their own snacks, board games, or anything else along for the ride. Seating in the Club Car is open so feel free to move around, meet your fellow passengers, and socialize in this informal setting. Please, no outside alcoholic beverages allowed. Walk-up Club Car tickets are available first come first serve up to departure time. Reserved Tickets are encouraged to guarantee seating availability.